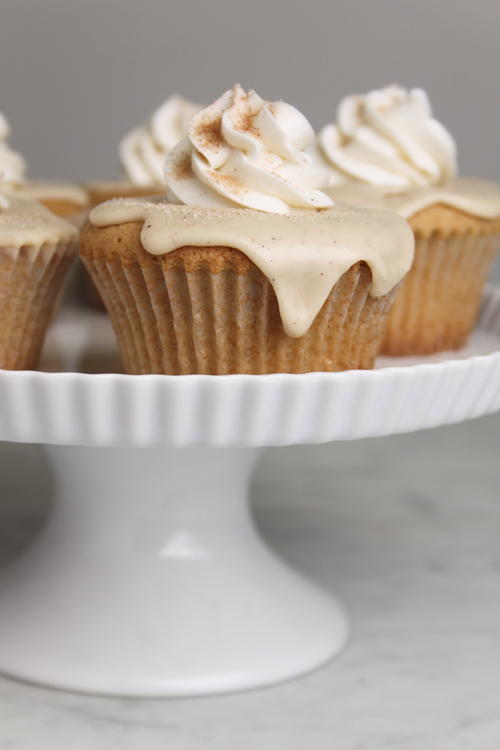 4 easy variations to the batter base to suit every craving + mood. There are days when only baking (and more truthfully, devouring) a slab of warm, chocolatey goodness will set things right again. Combined with a fit of mercurial indecision and a wild burst of energy, these days yield FOUR pans of brownies (and very happy neighbors). Melt the butter and pour over 2 cups of the chocolate chunks, the white sugar, and the brown sugar. Mix until combined. Add the eggs to the mixture one at a time, mixing after each addition. Mix together the dry ingredients separately, then add to wet mixture. Don’t over mix! Incorporate the remaining chocolate chunks (1 cup). Spread into a buttered 9×13 pan. Top with additions if desired (see notes below). Bake for about 40 minutes, or until center is set. 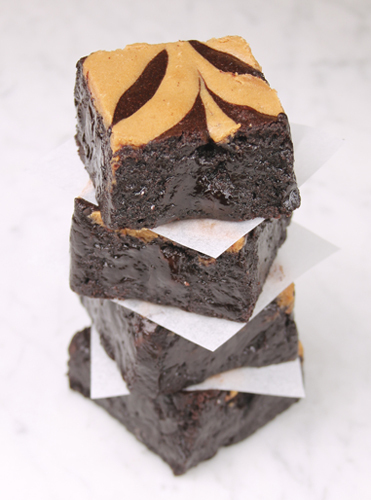 Do not use the toothpick test – it will result in overdone, dry brownies! Mix cheesecake batter from ingredients above. 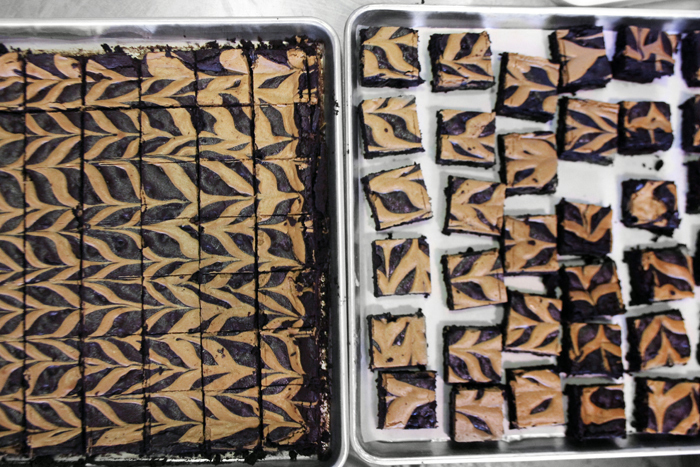 Swirl into the brownie batter in the pan, dragging a knife through the mixture for a marbled design. Bake. Heat sugar on medium heat in a heavy-bottomed saucepan. As the sugar begins to melt, stir vigorously with a whisk or wooden spoon. Boil until a nice golden color is achieved, but be careful not to burn. Slowly add the butter, then drizzle in the heavy cream- slowly because the mixture can splatter like hot oil. Remove the sauce from the heat and mix in the salt. Either top the raw brownie batter with the sauce then bake, or drizzle on brownies afterwards. 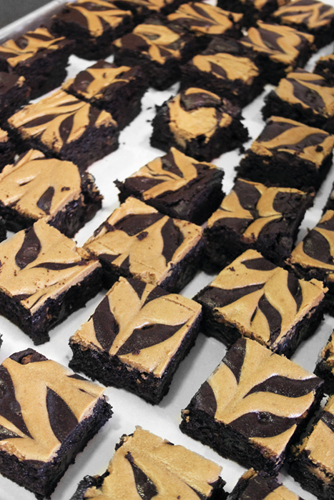 The former will yield brownies with a baked in caramel flavor; the latter are messier but will retain the consistency of the sauce on top. Sprinkle marshmallows and graham cracker pieces over brownies halfway through baking time (after about 15 minutes), returning to oven for remainder of baking time. Alternately, spread half of batter in pan, top with graham crackers and marshmallows, then remaining brownie batter. Bake as normal. This lightly citrusy cheesecake is tall and decadent, creamy without being too heavy, and absolutely sure to impress. Both people who swore they hated cheesecake and those that hated lemons (who hates lemons?!) sang this cake praises. It’s not difficult to make, but keep in mind that it does need to be made a day ahead of serving in order to chill. Preheat oven to 350°F. Stir the cookie crumbs and the butter in medium bowl until evenly moistened. Press the mixture onto bottom of 9-inch-diameter removable-bottom cheesecake pan. Use a tall pan (at least 3 inches) because this recipe makes a very tall cheesecake. Also, I like to line the bottom of cheesecake pan with parchment. Bake the crust until deep golden, about 12 minutes. Cool completely. Reduce the oven temperature to 325°F. Stack 3 large sheets of foil on work surface. Place same cake pan in center. Gather foil snugly around pan bottom and up sides to waterproof. Using an electric mixer, beat cream cheese in large bowl until smooth and fluffy. Gradually beat in the sugar, then the salt. Beat in the eggs, 1 at a time. Beat in the sour cream, grated lemon peel, and lemon juice. Pour the filling into the pan. Place the wrapped cake pan in large roasting pan. Pour enough hot water into the roasting pan to come halfway up sides of the cake pan. Bake the cake until the filling is slightly puffed and moves only slightly when pan is shaken gently, about 1 hour 25 minutes. Remove the cake pan from water bath; remove foil. Cool the cake in the pan on a rack for 2 hours. Then chill uncovered until cold; cover and keep chilled at least 1 day and up to 2 days. Run a knife around the sides; carefully loosen pan bottom from sides and push up pan bottom to release cake. Place cake (still on the pan bottom, unless you’ve lined the pan with parchment) on a platter. Garnish with lemon leaves or twists. I’m just beginning to feel winter in the air, but I’m already longing for hot summer days. Here’s a throwback to a job I did a couple months ago illustrating the step-by-step process of making ice cream sandwiches. Beer float? Strange, yes – but interesting enough to be worth the risk. Really. 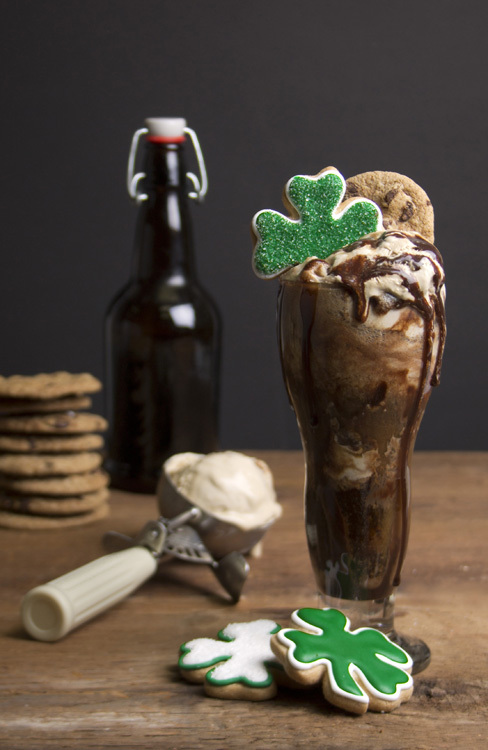 This version uses Guinness and coffee ice cream; neither are crowd-pleasers, so experiment with flavors and brews to your heart’s content. Scoop some ice cream into a frosted mug. Slowly pour the beer, stout, or ale over the ice cream. Top with chocolate or caramel syrup. 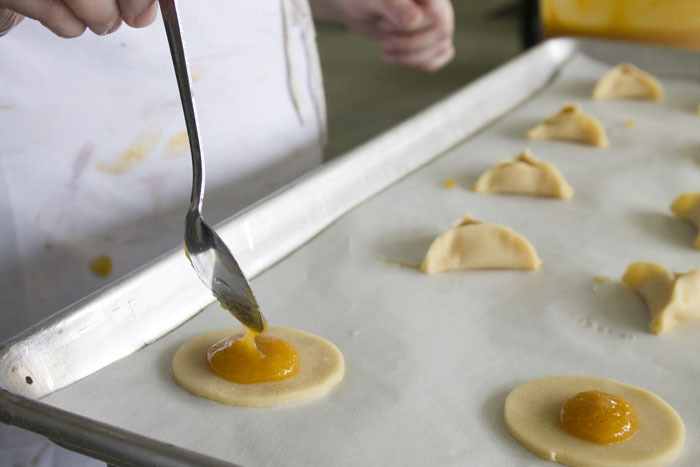 Chag Hamantashen Same’ach – Happy Purim! I’ll go-ahead and admit it: before I moved to NYC, the only Jewish holiday I could name was Hanukkah. As an attempt at some justification of this inexcusable ignorance, .03% of the population of North Carolina (where I spent a decade of my formative years) is Jewish. Side effect: I lived a Hamantaschen-deprived life. Hamantachen are cakey sugar dough cookies with a filling, most traditionally poppy seeds or prune butter made & eaten to celebrate Purim. Purim is a holiday similar to Mardi Gras in that it is celebrated with lots of heavy drinking and masquerading. It celebrates the story of Esther, whose bravery saved the Persian Jews 2,500 years ago. The hamantaschen recipe below is my friend Jill’s, by way of her Jewish boyfriend’s grandmother. Those are her hands in the photos, too! Cover 2 baking sheets w/parchment or foil. Either by hand or with a mixer, combine the oil, eggs, vanilla, water, sugar, baking powder and flour and knead until a soft dough forms. Roll the dough out into a very thin layer. 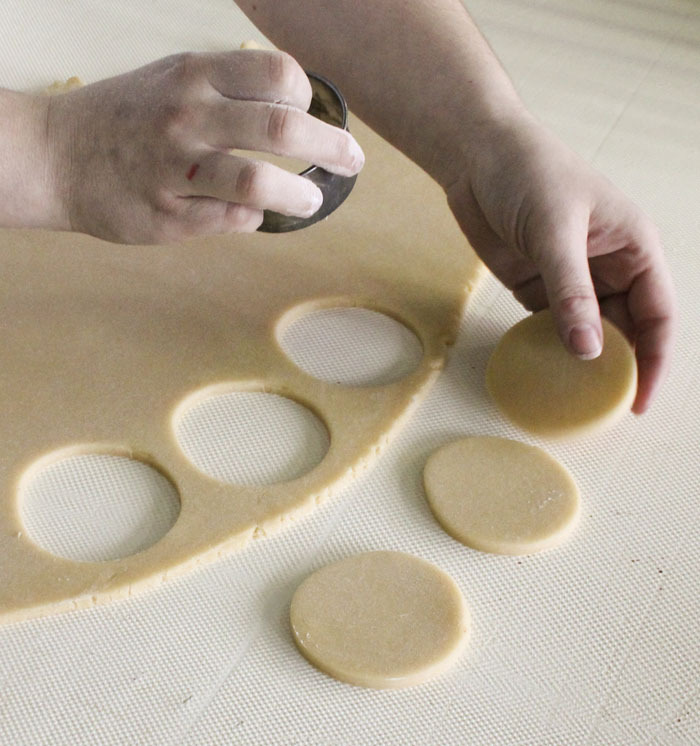 Dip the rim of a 3 or 4 inch cup or glass in flour and use like a cookie cutter to cut the circles. 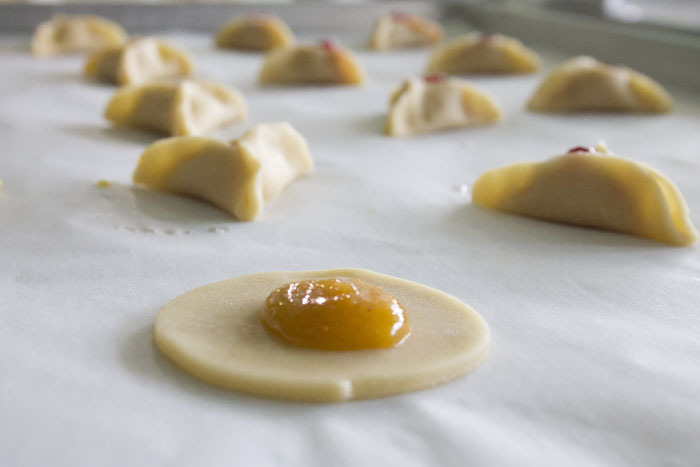 Re-roll the scraps of dough and reuse. 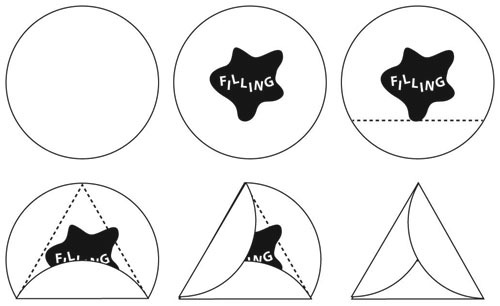 In the center of each circle drop a teaspoon of your filling. Shape into a triangle by folding 2 sides of the circle to the center, and pinch together at the corners. Make sure corners are tightly pinched so they don’t open during baking. 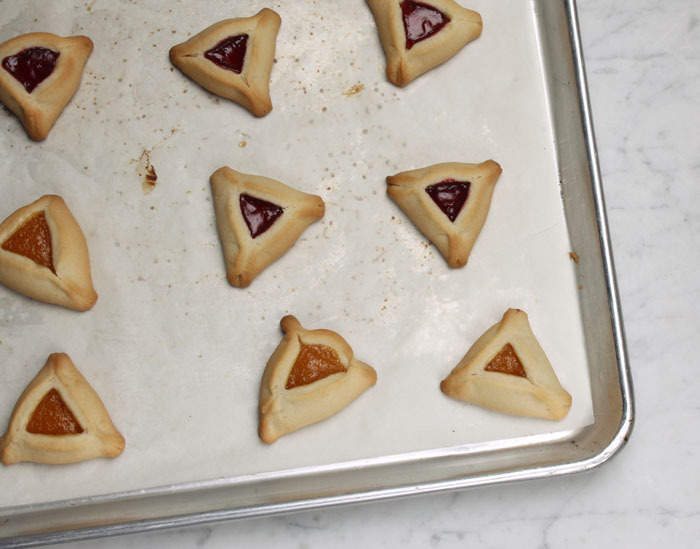 Place hamantaschen 1 inch apart on the baking sheets. Brush with beaten egg. Sprinkle with the cinnamon/sugar. Makes 4 dozen. Hamantaschen freeze well. Pour boiling water on poppy seeds and drain. After poppy seeds have settled to bottom, chop up fine. Add egg and sugar, stirring well. Combine everything into a saucepan (except brown sugar) and cook on low heat, stirring every few minutes. Heat to boiling. Lower heat to simmer, cover pan and cook for 20 minutes, stirring every few minutes. Mix in the brown sugar. Cook, reducing the liquid and stirring every few minutes being careful not to scorch the mixture. Mash with a wooden spoon until the prunes are soft and broken up and mixture is about the consistency of oatmeal (about 20 more minutes). It will thicken more when cooled. Keeps in the refrigerator for up to 3 weeks and also freezes well. My apologies to the easily offended. Candy solutions to off-color problems must be shared. In my defense, lest I be judged a total lech, these cupcakes weren’t my idea. 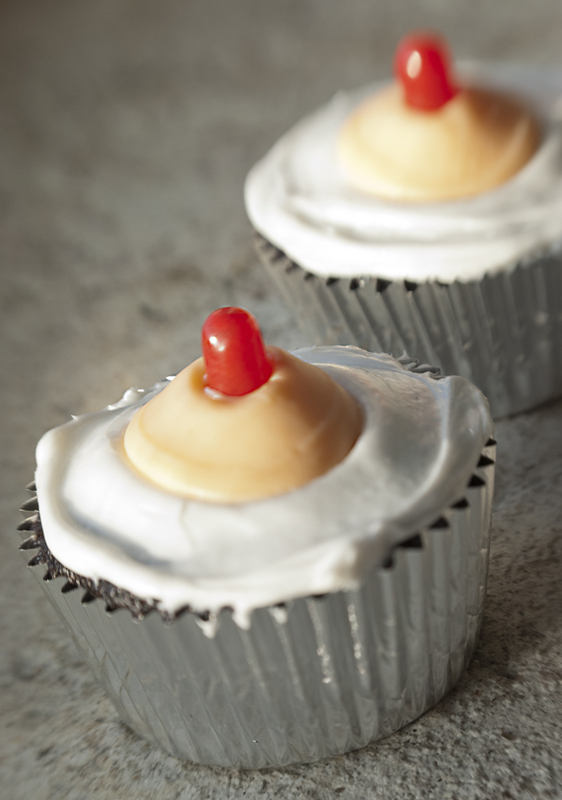 These naughty cakes were a special request from a friend, a gift to her husband at his birthday party. I used plain vanilla frosting, but chocolate would work just as well, or vanilla with a little food coloring to achieve a more realistic flesh-tone. Cocoa beans naturally start out at about 50% fat. After fermenting, drying, roasting, and de-husking, the beans are ground to a paste; at this point it’s essentially baking chocolate. When put through a hydraulic plate press, squeezing out about half of the cocoa butter, a hard disk of concentrated cocoa remains. This block is then ground into cocoa powder. 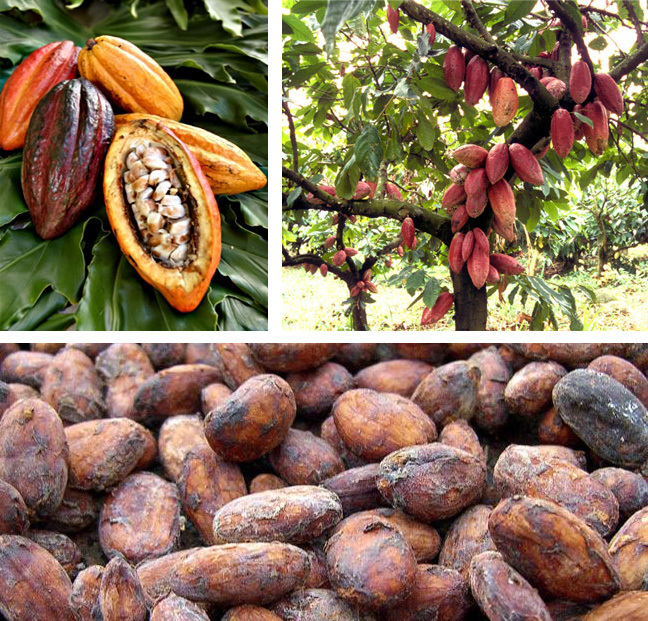 Natural Cocoa Powder: cocoa beans that have been roasted and ground into a fine powder. Baking soda, which is alkaline, is generally paired with natural cocoa in recipes to neutralize its acidity. Dutch-Processed Cocoa Powder: dark, milder tasting cocoa powder treated with an alkali (potassium solution) to neutralize its natural acidity. Baking powder, also near-neutral in pH, is paired with Dutched cocoa in recipes. 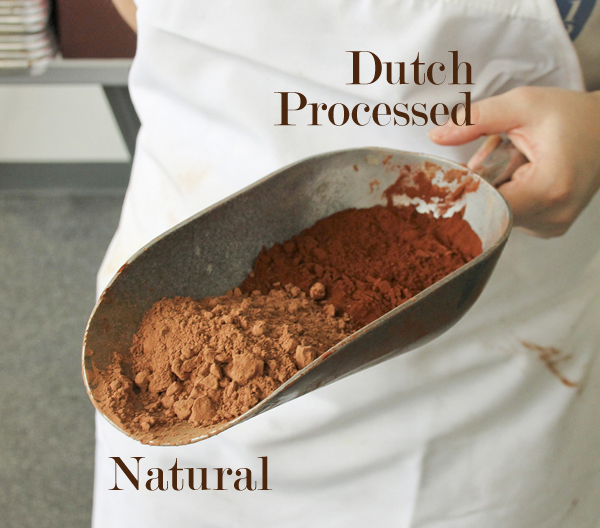 To replace natural cocoa and baking soda with Dutch-process cocoa, substitute an equal amount of Dutch-process cocoa but replace the soda with twice the amount of baking powder. For Dutch-process cocoa powder and baking powder, substitute the same amount of natural cocoa but replace the baking powder with half the amount of baking soda. Pour your favorite brownie batter into a greased pan. Fill a piping bag with cream cheese mix (for a 9″ square pan: 8oz box of cream cheese, an egg, sugar and perhaps a flavoring or extract). Pipe thick lines of cream cheese filling across the length of the pan. Drag a knife through each line of cream cheese, alternating direction with each stroke. Voila! Preheat oven to 300°. Melt chocolate (carefully!- do not overheat) and put into mixing bowl fitted with paddle attachment. Add softened butter in small chunks to melted chocolate on low-speed. Mix and heat water, sugar and salt until sugar and salt are dissolved. Add warm (again, not hot!) water mixture to chocolate mixture once butter is incorporated. Add eggs and egg whites slowly on slow speed. Mix, scrape down sides of bowl, then mix again to make sure batter is combined. 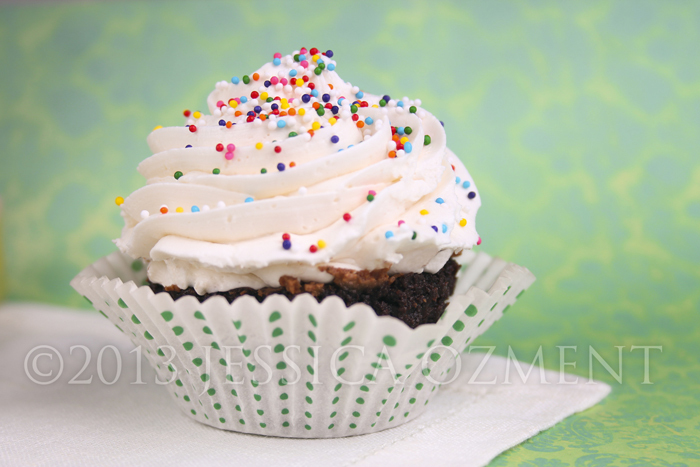 Fill cups a 1/4 inch from the top and bake mini size for 30 minutes, standard size for 60 minutes.